"Local people should be in the driver’s seat, with international interveners advising from the back seat." 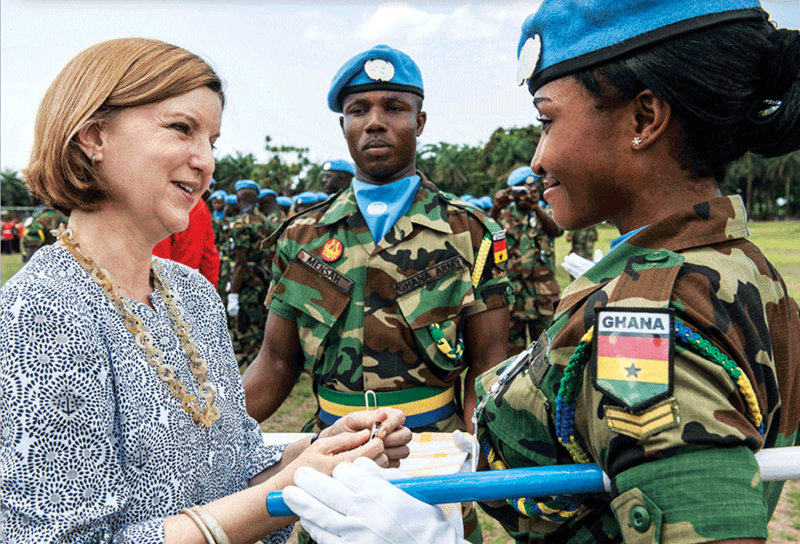 In her book Peaceland, political scientist Séverine Autesserre (Barnard College, Columbia University) analyzes the everyday practices, narratives and habits of interveners in peace operations and how these often-unconscious factors influence and sometimes impair the effectiveness of international efforts. In this edited transcript of an interview with CIC Research Assistant Rahel Kroeker, Autesserre talks about Peaceland, its relation to the High-level Panel on Peace Operations (HIPPO) report, and the ways in which UN peace operations can be improved in order to achieve sustainable peace. Rahel Kroeker: What motivated you to write Peaceland? 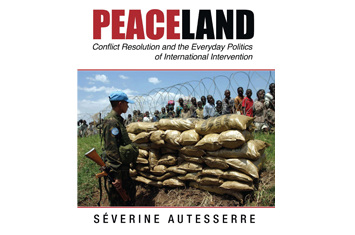 Séverine Autesserre: Peaceland is based on my experiences as a humanitarian aid worker, a consultant to the UN and other peacebuilding organizations, and an academic researcher. My goal in the book was to understand why peace interventions so often fail to reach their full potential. During my time working in conflict and post-conflict environments, I found that interveners often perpetuated behaviors and practices that were clearly ineffective or counterproductive. For instance, we know that expatriates shouldn’t live in a bubble isolated from local populations, and yet when you look on the ground, interveners often do not interact enough with ordinary people. Peaceland tries to understand why these things happen, and why people who genuinely mean to do their best often perpetuate ineffective practices that harm the success of a peace operation. My other main goal in Peaceland was to shine a spotlight on the peacebuilders who reject the dominant ways of thinking and working, because these exceptional individuals and organizations are much more effective at building peace. RK: How do you define peacebuilding, interveners, Peaceland, and measure the effectiveness of a peace operation? SA: Expanding on Boutros Boutros-Ghali’s definition, peacebuilding means any and all actions that help promote peace during and after a conflict. It encompasses any kind of action that my interviewees said ‘helped or were supposed to help bring peace’. This includes peacemaking, peacekeeping, traditional conflict-resolution programs, political and military efforts, certain development and humanitarian initiatives, as well as certain human rights projects. Interveners are the expatriates (the foreigners) who work in peacebuilding. Peaceland is a metaphor for the world of international peacebuilders – a world that has its own rituals, narratives, practices, habits, ways of working, and pecking order. I decide that something I study is effective when a large majority of people involved in it – both international interveners and local beneficiaries – see it as having promoted peace. RK: Some critics say you’ve lumped together too many types of interveners as “citizens” of Peaceland. SA: Of course there are enormous differences between the inhabitants of Peaceland, but we all know about these differences, while we often overlook the similarities. I remember once interviewing a provincial minister in Congo and he was constantly talking about the UNGOs as if [the UN and INGOs] are the same thing. Another time, I was talking informally with an ordinary citizen and he was telling me about ‘this soldier who works for this NGO’. I told him no soldier is working for an NGO. These local people are very savvy and they know the difference between NGOs and the UN, but they were trying to communicate something else: there are similarities among the interveners in terms of habits and narratives. The acknowledgement of these similarities reveals many interesting insights. RK: Peaceland identifies a rift between intended beneficiaries and interveners of peacebuilding missions. You describe how the “construction of knowledge” and the politics of knowledge are one of the major explanations for this rift. Can you elaborate? SA: In the international peacebuilding system, thematic and technical expertise – how to do conflict resolution, intercultural reconciliation, organize elections, and promote gender equality – are valued much more than local knowledge. You see this in the way the management systems of INGOs, NGOs, diplomatic and donor missions work. People are almost always recruited on the basis of their technical and thematic expertise. The consequence is that the large majority of foreign peacebuilders I interviewed had little preexisting knowledge of their country of deployment. When trying to understand their place of deployment, most interveners end up relying on what I call “dominant narratives”: stories that people tell about the conflict and that everybody believes. The dominant narrative on the Democratic Republic of Congo, for example, is that the main cause of violence is the illegal exploitation of mineral resources, the main consequence is sexual violence, and the central solution is reconstructing state authority. In Darfur the dominant narrative is Arab versus African. In Timor-Leste it is East versus West. These dominant narratives are so simplistic that they overlook the myriad other causes of violence and lead to programs that are counterproductive and sometimes even fuel the violence. RK: What are some ways that the walls between interveners and local communities are built and maintained? SA: Foreign peacebuilders share the experience of being outsiders living and working in environments that are very unfamiliar and where they have no family. Very often they are afraid for their lives, they don’t necessarily understand local languages, and they know that people may die if they make an error in their work. It’s a high-stress job. This shared experience explains why, despite knowing it would be good for them to socialize with local people, they often just want to be with others who speak their own language and who can understand what they are going through. Foreign peacebuilders go to the same bars, the same restaurants, and they tend to have many more friends within the expatriate community than in the local communities. That’s how we get an expatriate bubble. Daily routines also reinforce these boundaries. Safety precautions such as living in a compound, for example, or having to drive with doors locked and windows closed can have the unintended effect of creating a further divide between interveners and local communities. Another important factor is the very goal with which foreigners arrive on the ground: ‘We are here to help the population’. When you say you are ‘here to help’, you automatically put yourself on higher moral ground and construct an image of yourself as being superior to the local people. This divide and the constant emphasis on the eminence of interveners sours the relationships between peacebuilders and their local counterparts. As a result, local people frequently reject or evade the international initiatives designed to help them. Of course, there are exceptions. There are expatriates who try to socialize with local people, who speak local languages, and who integrate into the local communities. And these people are much more effective in their daily peacebuilding work. But they are far fewer. RK: How can the imbalance of technical and local knowledge be addressed? SA: Rather than only recruiting people based on their technical and thematic expertise, we should also select employees based on their local expertise. Further, we can replace expatriate staff with local people in many administrative, logistical, and procurement positions. And at least some local employees should be recruited from the specific communities targeted by the peacebuilding project in question. Lastly, the current practice is that foreigners decide, and local people assist and advise; I think that should be reversed. Local people should be in the driver’s seat, with international interveners advising from the back seat. The Eastern Congo Initiative [ECI] has followed this kind of approach. ECI’s first staff in Congo was an expatriate who spoke perfect Swahili, perfect French, and had been in Congo already for several years. For her first assignment, she was tasked with spending up to a year trying to hire a Congolese director and talking to local people about what would be ECI’s best contribution to resolving the problems in Eastern Congo. RK: How can the boundaries between interveners and local counterparts be overcome? SA: We could encourage combined facilities where international interveners share office space with local organizations. I saw so many local organizations that were facing problems because their printer was broken or their phone line was cut and they didn’t have money to fix these things. Sharing resources could help fix such problems and would also encourage socialization that, in turn, would facilitate breaking down boundaries. Encouraging after-work socialization is also very important. Social and professional events are often only for the expatriates. They could be opened to local staff and partners, and specific events for networking could be organized. When hiring and promoting expatriate staff, we should consider their ability to connect with local communities and foster relationships as well as their knowledge of local languages and their understanding of local cultural codes. Because when interveners don’t understand the local context and don’t speak local languages, it’s very difficult for them to interact socially with local people. But when they do speak the language and understand the cultural codes, then it’s much easier for them to socialize after work and build productive relationships. Local communities also have to meet international interveners halfway. I’ve heard of colleagues who, upon arriving in a community, had a kind of local mentor. Someone who said, ‘Ok, I’m going to tell you how things work here and I’m going to tell you when you’re making a cultural faux pas.’ That’s very helpful. You need these kinds of people because they help expatriates integrate into local communities. RK: There might be concerns that some of the solutions you propose are too time-consuming. SA:It would be time consuming, but not overly so. Yes, it would mean that interveners have to slow down. But, when we consult local people, they actually ask for international interveners to slow down. They say they’re willing to bear the cost of that, that they would much prefer to have an intervention where people at least take some time to think about what they’re going to do. The consequences of acting first and thinking afterwards are so damaging that it’s often better to not act until we’re sure that we are going to help the situation rather than make things worse. This idea builds on the work of the Listening Program, which I love and keep citing in my book. RK: The High-level Panel on Peace Operations [HIPPO] report calls for more “field-focused” and “people-centered” missions, especially in its section on engaging with communities. How can this improve the relationship between interveners and local people? SA: I love that HIPPO talks about the importance of understanding local dynamics through discussion with local people. That’s the central point of my first book, The Trouble with the Congo. The report says that local conflicts matter and we need to understand local dynamics in addition to national and international dynamics. And if we want to understand that, we need to talk to local people and engage them beyond the small elite of local individuals who speak French or English. The report emphasizes that we need to work more in partnership with local people and include them in the design and planning of peace efforts. 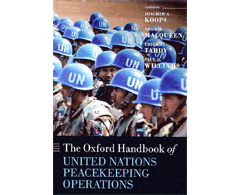 We need to pay more attention to local cultural and linguistic cues and country expertise, and support more local conflict resolution initiatives – again a huge point of my first book. We need to add some downward accountability mechanisms and not ignore local capacities for peace. All of these are definitely steps in the right direction. To me what really matters is how these recommendations will be implemented and interpreted on the ground. Unfortunately, the report itself has just five paragraphs on “Engaging Communities”. I am aware of the constraints that the authors were facing, but I would have wanted much more emphasis on community engagement. At the same time, we don’t need a high-level panel to tell people to go have a drink with their local counterparts after work. Change can come from the top and the bottom. This report is a way to drive change from the top, but every international peacebuilder on the ground can make change happen from the bottom as well. It’s a daily choice and a daily responsibility for them to decide: Do I want to be a Peacelander, or do I actually want to be one of the exceptions that make things better? RK: Can the mindset change proposed by the HIPPO report impact how other organizations work on the ground? SA: The panel’s report is for UN missions, but I stress in the book that UN peacekeeping missions are just some of the many organizations that employ these problematic everyday practices, habits, and narratives. Other UN agencies do this as well, as does the whole aid community: NGOs, donors and diplomats. We would need a high-level report for every single one of them, and have change coming from the bottom for each of them as well. But recommendations like those found in HIPPO can certainly motivate change across all actors in Peaceland. RK: HIPPO is dedicated to “Nyakhat and Others” – Nyakhat being a little girl in South Sudan who sought the help of UNMISS for her blind father by walking “four hours through harsh and dangerous terrain”. The report begins with her story and ends with a paragraph on Nyakhat’s hopes and expectations for the UN to bring peace. Does this framing reinforce the paradigm of the “here to help” narrative and the inequality of power relations between host populations and interveners? SA: I always tell my students to start with a story − I do get that. I think the broader point with this kind of framing is that it really depends on what you do with the story. Is the story ‘Oh let’s all come and help Nyakhat’? If so, then yes, it reinforces the ‘Ethics of Care’ and it reinforces paternalistic discourses. But if the story is rather ‘Let’s all do everything we can so that Nyakhat (when she grows up) can help herself and her country, and be in the driver’s seat,’ if we are saying that she can build peace in her community and we’re going to come in support of her, then that’s a completely different story. And I sincerely hope that my Peaceland book will not only help change the way these issues are framed, but also encourage more equitable power relations between host populations and interveners on the ground.